If you have lost all your teeth, traditional dentures can sometimes be a solution with limited success. At times they can be unstable, uncomfortable and make eating difficult and not enjoyable. However with modern dentistry there are now a variety of solutions to overcome these issues. The All on 4 treatment replaces your missing teeth with a fixed in dental bridge which is supported by four dental implants. It ensures greater stability in the bone and reduces the need for bone grafting surgery due to the special angle of the implants; it ensures a secure and stable anchorage for the replaced arch. With just four implants treatment times are reduced as are cost. We are normally able to place temporary provisional teeth on the same day of treatment. These teeth look and feel much like natural teeth, so you can lead a normal life straight after surgery. After a few weeks of healing time we can place your final bridge. There are two options for this – either a fixed option (one with the highest degree of durability and chewing function which cannot be removed) or a removable option (this can be removed by you for easy cleaning). Your quality of life is improved and you can start enjoying your favourite foods again with confidence. Am I suitable for All-on-4? Before beginning treatment the dentist will perform a thorough assessment to ensure suitability of treatment. Implants have the highest success rate when performed on suitable candidates. Factors posing as risks to success are if the patient is diabetic or smokes heavily. Smokers must note they are two and a half times more likely to experience failure than non-smokers. However, this does not preclude smokers from having implants. Those who suffer from gum disease will need to have the condition dealt with prior to proceeding with implants. Treatment may be a professional clean by the hygienist (to decrease bacterial count) and a continuation of good oral hygiene regimes at home. For severe cases of gum disease a more intense gum treatment performed by a periodontist may be necessary. It is important the patient understands the importance of good oral hygiene and is able to undertake daily brushing and flossing using correct techniques prior to the placement of implants. You should discuss your suitability with us before contemplating undergoing the All-on-4 treatment. 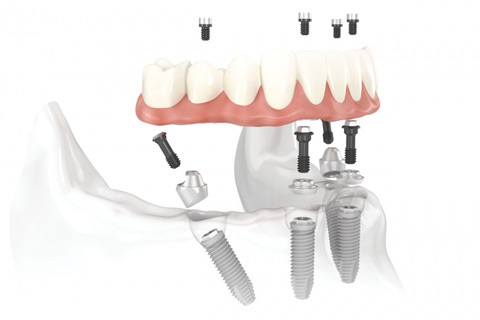 Durable and stable implants are a great way of preventing the inconvenience of denture looseness, slippage and wear, which helps when eating and talking, and allow the new teeth to be treated just like regular teeth. Those who have All-on-4 dental implants experience the same ability to eat as people with a full set of natural teeth and will experience no difference in taste, i.e. the ability to eat hard and sticky foods which are normally challenging to denture wearers. The teeth All-on-4 do not rub against the gums (thus no ulceration with denture wear) as they are securely anchored into the dental implants. All-on-4 replacement teeth are fixed permanently in the mouth and can be cleaned just like natural teeth. In time you will not think about the fact that you have implants. Meet the Black Swan Dental Spa team or see our standard prices.